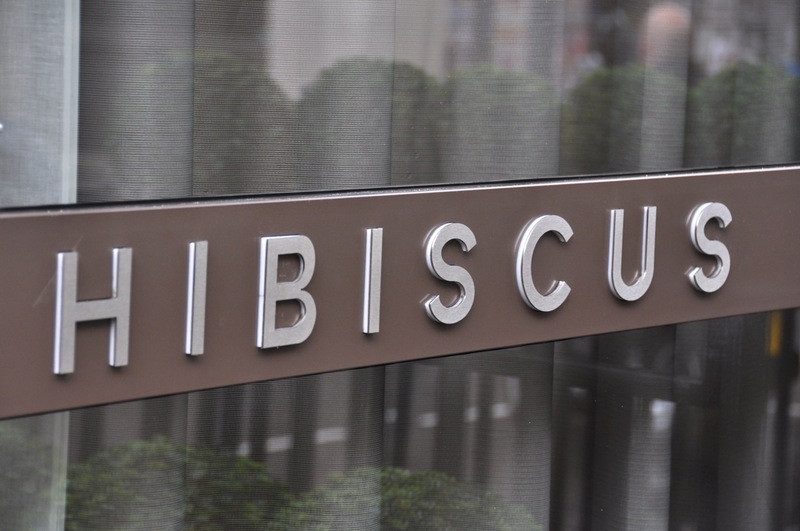 Hibiscus is a 2-Michelin star modern European restaurant in London off Regent Street. We went there as a party of 3 for lunch on a Friday, and the restaurant was full with most of the guests in their business Friday khakis having their Friday boozy long lunch. We found the restaurant quite small space-wise and each table was rather tightly packed. 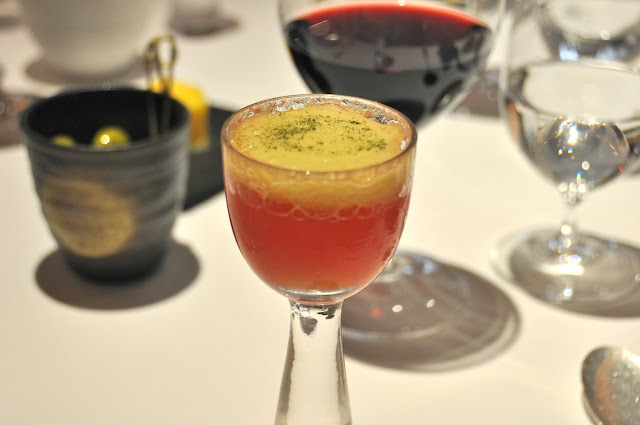 While we were deliberating over the menu, we were served an amuse bouche of watermelon juice with pineapple froth with bubble blobs at the bottom (with a similar texture to the bubble in bubble tea, the early-noughties Taiwanese drink craze). For the appetiser, my sis chose the royale of crozier blue (a kind of blue cheese), caramelised hazelnuts, warm veloute of brocolli and almonds (i.e. brocolli soup with blue cheese and nuts). 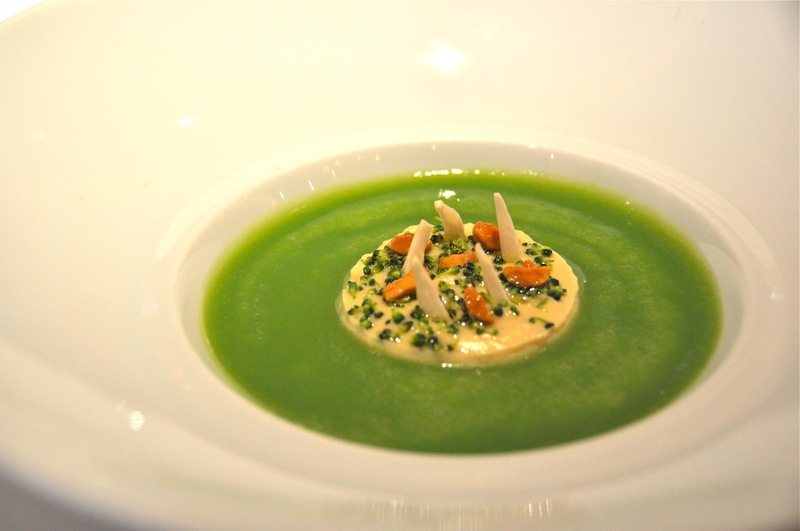 She thought that the nuts were a nice touch, the brocolli veloute did not taste like brocolli and overall the dish was pleasant enough without much flavour. The rest of us went for the Elwy Valley welsh mutton and foie gras, fricassee of puy lentils, blood nectarine and Ras el Hanout (an African spice). 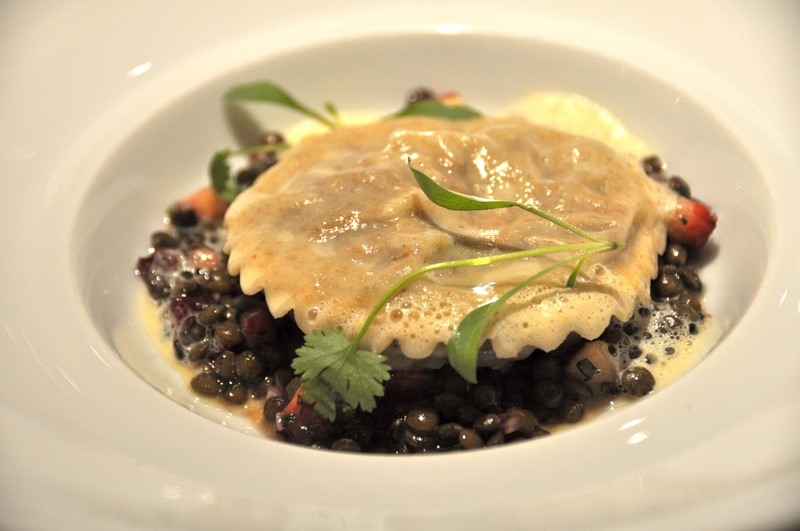 In effect, this was a giant ravioli stuffed with mutton and foie gras, sitting on a bed of lentils. The ravioli was very good; we could taste a slight cumin/curry taste in the mutton stuffing (must have been the Ras el Hanout), although the foie gras flavour was quite muted but still contributed to the overall richness of the ravioli. The ravioli itself was made with a very light pasta, hence it was not a heavy dish despite the size of the ravioli. The lentils were delicious and went well with the rest of the dish. 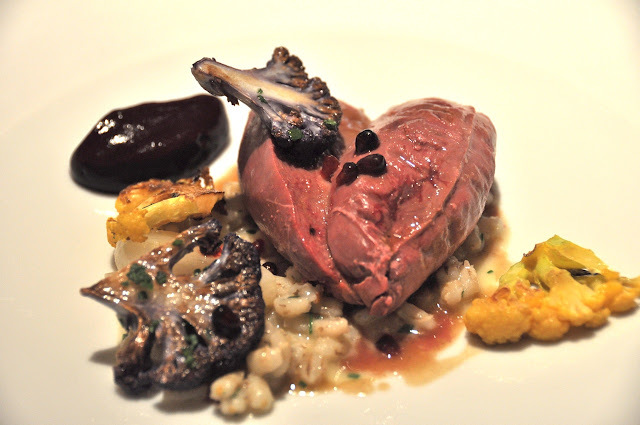 For the main course, we all opted for the wood pigeon, pearl barley, roasted cauliflower with smoked blackcurrant puree. There were mixed reviews around the table for this. My wife did not like it. My sis and I, on the other hand, quite fancied it and I ended up eating half of my wife's portion. When the dish was first served, it looked like a plate of innards, with the red pigeon looking like a heart and the blackcurrant puree looking like a bloodied liver. The pigeon though blood red throughout, did not taste like it was raw or cooked rare as it wasn't bloody. It was quite a unique dish though I can imagine that some people may find it too gamey. Dessert was where this meal really stood out. 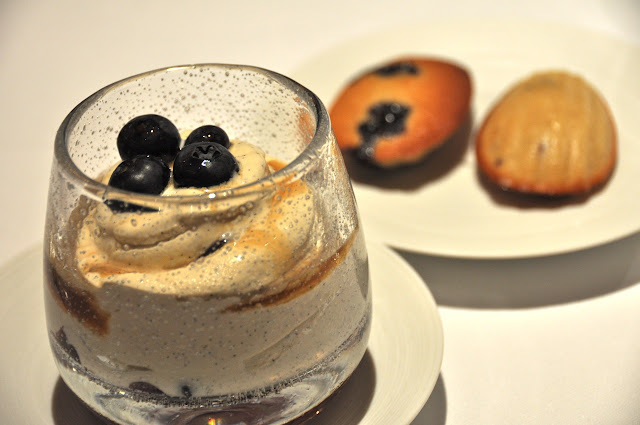 For me it was the Hopton Heath late harvest Shropshire blueberries, vanilla ice cream, whiskey sauce and warm honey and blueberry madeleines. I was really taken by this dessert. The vanilla ice cream was smooth as silk and the whiskey sauce gave it the complexity which vanilla ice cream normally lacks. The madeleines was pretty good too. The rest of the table went with the crushed Provence figs, fig roll, fig ice cream and verjus (a kind of grape juice), and they really enjoyed it as well. 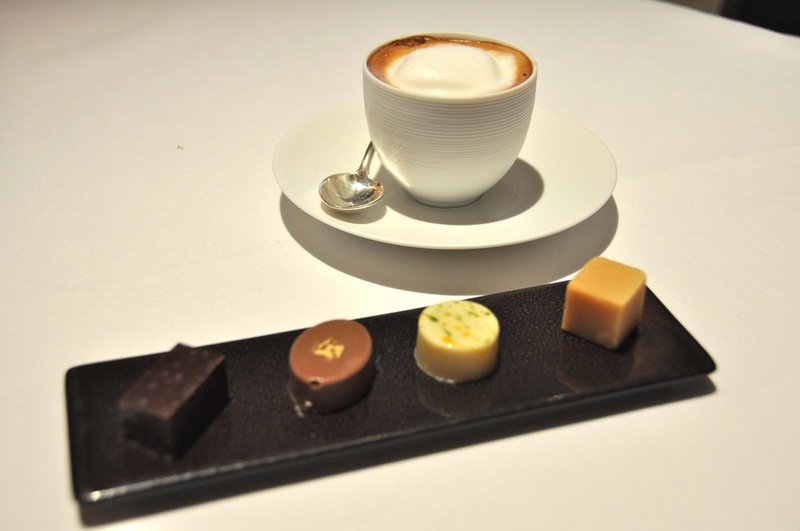 Lunch ended with a nice cappuccino and some petit four. 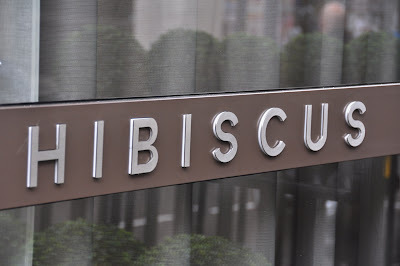 It was a good value lunch menu (£38++ per person for 3 courses with a glass of wine, coffee and petit four) for food this good. 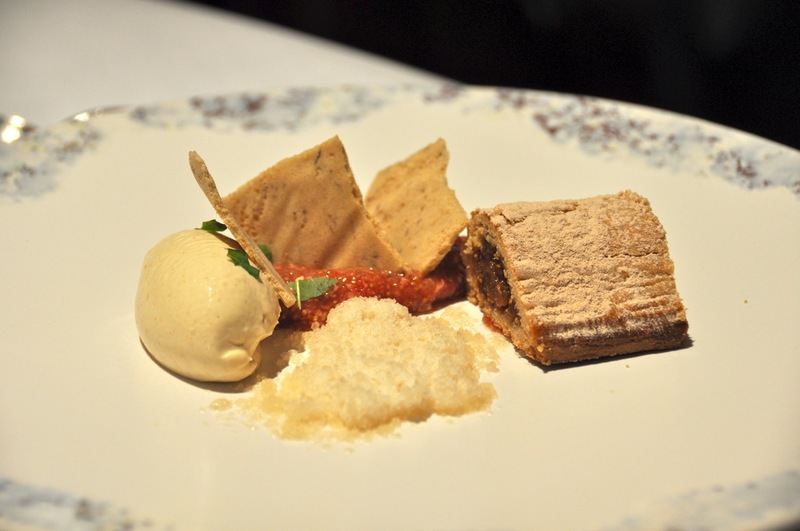 Food: Well executed, loved the desserts.